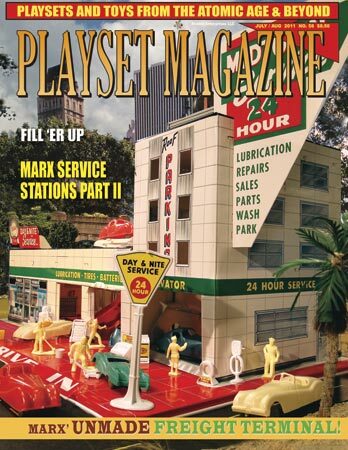 Issue 58 - Service Stations, Part II. We hope your summer is going just great, and to help get you "on the road" for vacation we present to you this Happy Motoring Gas Stations Part II. (1957 - 1960) . Someone recently asked, just four years' worth of coverage? But you'll see why when you open this baby up -- there's plenty of detailed information for you, colors of stripes to the type of cars included, to sets of figures and the big changeover in accessories from pumps to tire displays and battery chargers (that's right -- BATTERY CHARGERS!) . In fact, we cover the whole change from Marx' "Independent" style service station to their large, gleaming counterparts with that great flying wedge-shaped sign that became so prominent on later sets. This is a big change in playsets, similar to the ones the Farms went through in the late 1950's. Also this issue we're proud to present Bob Jones' Tim-Mee Atomic Tank, and some great new coverage on Aohna Greek Warriors, Giant's Little Trojans (you can see a mini-theme there!) and a super rare, never before shown un-made Marx Trucking Terminal! There's also featured reviews on CTS' newly produced second set of GI's, and Camp Randal Miniatures city ruins. And a big story on the Indy show by your editors. Plus vintage toy sales ads, show info, news and updates, letters and more! Have a great summer and happy motoring!